What is the bridal shower ribbon hat? It is a tradition still used by many, to use all the bows received from gifts and assemble a hat If you've never seen this activity at a shower, you may not be familiar with this custom. It probably started as a symbol of luck and good fortune. An alternative to the ribbon hat, is to make a bouquet. This uses the decorations from the wrappings into a bouquet which will be used at the wedding rehearsal. Both ideas are for fun, and picture-taking. • How is it made? The bows from the gifts received are individually attached to a paper plate. Typically, one of the paper plates from the party is used as the base, but any other cardboard container could be used. Tape, staple, or glue the bows to the plate. Punch a hole on each side of the holder. Then, thread some ribbon streamers, long enough to be tied, on each side of the plate. • Any tips for assembly? Use your judgement. If there are many bows of the same color, keep them toward the center, and build outward. If there are a variety, place ribbons in a way that the colors are pleasing to the eye. • What do you do with it, at the shower? The "hat of bows" is then secured in place on the brides head. Pictures are taken, mainly as a tradition. Depending on the bride, there may be one pose, or a variety with the bridesmaids and different guests. • How about after the shower? Some traditions have the woman wearing this on her head at the church wedding rehearsal, instead of the veil. More often, it is used as a practice bouquet. Either way, it is a symbol of the good wishes received at the bridal shower. Then it is saved as a keepsake. The bridal shower may be extremely large, in which case you would have a large amount of bows. You could decorate additional plates. These would be used by the bridesmaids as bouquets, at the wedding rehearsal. Of course, make sure the brides is more elaborate. and up to the guest of honor. 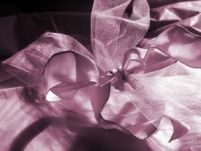 • Do You need gift wrapping ideas? • Go to the homepage.